This mediterranean quiche is all that and more. 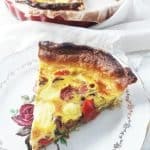 To make this quiche, you will need a red onion, one red bell pepper, a clove of garlic, a large and juicy tomato, one medium zucchini, 7 mint leaves, 1 premade roll of pastry dough (we always use organic), 3 eggs, some cream and your favorite cheese (we used swiss emmental but cheddar would taste amazing too). We use a combination of spices that we love called ras-el-hanout. If you can’t find it near you, that’s fine. You can replace it with 1 tsp of curry powder instead. (The spice combination is similar.) If you’d like to learn more about cooking with spices, download our free printable spice guide. You get excited about easy and delicious meals! You love experimenting with spices. You’re looking for a healthy meal with a European twist! We hope you love this blissful mediterranean quiche as much as we do! Can’t you imagine yourself enjoying a slice with a glass of rosé in hand? We can. Add red bell pepper and garlic. Cook for 10 minutes. Add tomato and ras-el-hanout (or curry powder). Cook 5 minutes. Line a tart or quiche mold with the puff pastry. Place baking beans on the puff pastry to keep it from rising in the oven. Put in the oven and bake for 10/15 minutes. Meanwhile, add zucchini and mint to the vegetable mixture in the pan. Mix eggs, cream, salt and black pepper in a bowl. Remove the puff pastry from the oven and remove the baking beans. Pour the egg mixture into the quiche mold. Pour the vegetable mixture over the egg mixture in the quiche mold. Bake for 10/15 minutes or until the puff pastry is cooked through and the cheese is melted. Serve with green salad (our favorite is arugula!). and hotel recommendations as well as their travel adventures on the blog.